Canadian sports gamers who prefer to EA Sports' NCAA Football franchise to Madden (more teams, more varied playbooks) are in for a treat. 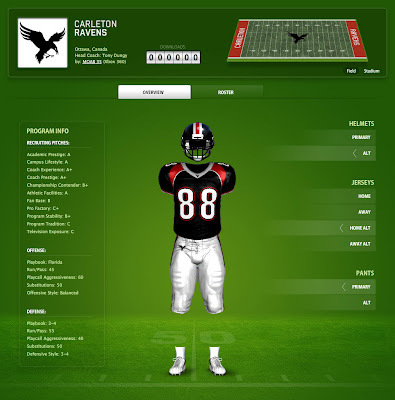 A few CIS diehards over the years have used the NCAA game's create-a-school feature to create a video version of their favourite team. NCAA Football 10, which is due in stores July 134, ups the ante because its new create-a-school (TeamBuilder) function which allows users to make their creations available for download by other gamers, enabling head-to-head play. Ten gamers could each play as an OUA school in a single 10-team conference (insert joke about the Big Ten having 11 teams). You can even upload the school's actual logo. The logical next step for the franchise is to make it possible for users to upload a school's fight song (you do not want to know how long I spent trying to find a NCAA team's fight song that somewhat sounded like Queen's College Colours). EA Sports said in a recent press release that users created teams at a rate of "seven per minute" during the first two days that TeamBuilder was up and running. Naturally, that includes many re-creations of CIS teams, which could allow 10 gamers to play out the OUA season. To see some of the teams available, go to easportsworld.com/en_US/ncaafootball/create_a_school and click on Browse Schools (you might need to download a new flash player, but it only takes seconds). Search for teams from the "state" of Canada, and you'll have a treasure-trove. There are at least 15 versions of the Laval Rouge et Or, 10 of the Western Mustangs and six of the Calgary Dinos. ... and here is Guelph sophomore defensive back Jarryd Baines. Nerds, the whole lot of you. I dont know who made Queen's but the Recruiting pitches are all wrong... School prestige - B+? and fan base is a C? Academic prestige A+, Campus Lifestyle A, Coach Experience A, Coach Prestige A, Championship Contender B+, Athletic Facilities C+ ahem, Fan Base A, Pro Factory A, Program Stability A, Program Tradition A+, TV Exposure A. They use Nevada's offence. Quick, ask Dan Brannagan how he likes the Pistol offence. this is so amazing ! couldnt be happier as a first year CIS player !